Let’s start at the beginning, what is a blog? Aren’t blogs those websites people use to talk about themselves and rant? Why would I want one for my business? A blog contains regularly updated informational content which is displayed on a website. The blog article topics are generally related to the overall focus of the website. Of course, you can choose to rant about your day, but that isn’t commonly found on business blogs. A blog provides you an opportunity to add content to your website that isn’t directly related to your core product. This allows you to optimize the pages of your website for keywords and phrases that wouldn’t naturally appear on your main landing pages. This content can help you target an audience higher up the funnel process. You can bring some new users to your site before they have realized your product could help them solve a problem. Where Should the Blog Live on Your Site? There are two common places where you would put a blog on your website. The first place is as a subdomain such as blog.yoursite.com. The second common blog location is as a directory such as yoursite.com/blog. The other place you might see a blog is right at the root of the homepage such as yourblogsite.com. Since it should be clear to you if your blog belongs on the homepage, we’re going to focus on the subddomain and directory placement options. The number one biggest difference between a subdomain and a directory is that a subdomain (blog.yoursite.com) is considered a separate site whereas a directory lives on the root domain. What that means is a subdomain keeps your blog completely separated from your main website. This can be nice for a couple of reasons. You can link to relevant pages on your main site from your blog site and they will count as external links. This setup also gives you a little protection if you receive a ranking penalty. Since it is considered a separate site the penalty won’t necessarily apply to your main website. One of the big downsides of setting your blog up as a subdomain (and the big upside for setting it up as a directory) is that any backlinks your blog site acquires won’t directly benefit your main site. This is one of the main reasons to set your site up as a directory. Typically, the main goal of your blog is to reach a larger audience through social shares and backlinks. If your blog is a directory on your root domain, then those backlinks help increase the backlink profile of your root domain. To decide if your blog should be a subdomain or a directory you have to think about the goal for your blog and what’s best for your users. For small businesses, having a blog as a directory is typically the smarter option. Do All Blogs Have Comments? Traditionally, yes, blogs have comments. These days, however, more and more companies are removing commenting systems from their blogs. About fifty-percent of blogs have a commenting system in place. Some companies find they spend a considerable amount of time maintaining the comment system and the vast majority of comments are low-quality or spam. That being said, a reason why a company would want to have comments on a blog is they build a sense of community. They provide a way for your users to reach out and ask questions. This not only provides you a channel to communicate directly with your users and publicly provide exceptional service, but you can also take these comments and feedback to get ideas for new content and new questions to answer on future blog articles. Another benefit of having comments on your blog (and arguably the most beneficial reason) is that they keep your blog article fresh with keyword-rich content. New comments make the article appear current and updated. And when users add comments to blogs, they naturally use keyword-rich phrases more often than you can insert in a natural way to the main content piece. Like any other online marketing tactic, you need to decide if comments make sense for your demographic and the goals of your blog. If you decide a commenting system is right for your blog, make sure you maintain it. When appropriate, reply to your users and make sure to remove spam to keep a high-quality blog. Do Blogs Need Social Share Icons? Almost every blog makes it easy to share on popular social networks. The most common purpose for a business to maintain a blog is to increase traffic to their website. One of the main tactics to do this is for people to share the content on social media. Why not make this easy to do? If you’ve decided it makes sense to have a blog for your business, you might as well make it easy for your users to share the content. If you don’t, you’re missing a big opportunity. What makes this an even simpler decision is the fact that there are so many free tools these days to make this a super simple experience both in regards to technical implementation and the user experience. Some of the most popular social share tools today are AddThis, ShareThis, and AddToAny. The easy answer is: as often as possible. It’s recommended that you post a blog article at a minimum of once a week. Large companies will post much more often than that, anywhere from 3 times a week to every single day to multiple times a day. I would recommend setting up a blogging schedule that makes sense for you and your business. Do you have time to blog every day? Great! Then, do that. Do you only have time to do one blog a month? Well, one blog per month is better than no blogs, start with that. 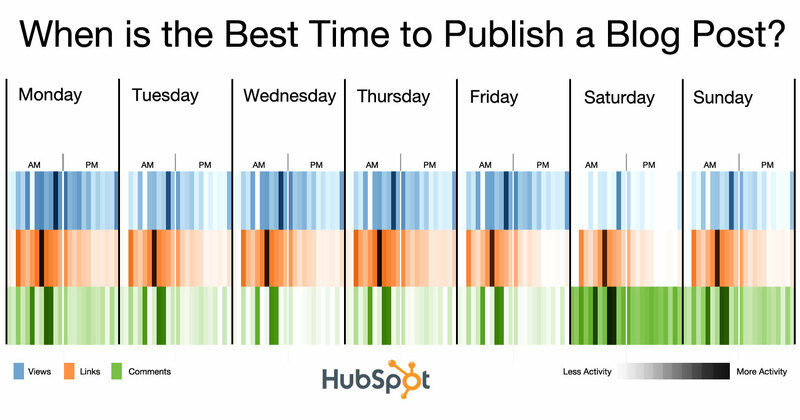 The most important part is to keep a consistent blog schedule. Research conducted by HubSpot shows blogging on Thursday mornings is the most effective. If you have the time and resources necessary, try to commit to a weekly blog article and schedule it to post on Thursday mornings every week. So, Do I Need a Blog? About eighty-percent of the top business websites maintain a blog. If maintained, a blog can be a great traffic resource and can expand your audience and bring new users that may not have been directly searching for your product. Content is a very important piece for search engine optimization. The content on your site is the valuable asset you want search engines to provide to users. If your website already has great content on all of your product pages, already has a thorough FAQ section, and answers every question your users have but you want to keep expanding content and getting more traffic; then yes, build a blog! If your website doesn’t have great existing content, but you have enough resources to continue to grow and maintain content for your core product while creating and maintaining a blog; then yes, build a blog! If you have to choose between starting a blog and creating product specific landing pages on your main website, then start with optimizing and maximizing your landing page product copy, then start focusing on your blog articles. A blog is important and you’ll likely find it beneficial to maintain one. Find a blog schedule that works for you and stick with it.